Last year I got a surplus airspeed indicator as a collectible item, airplanes instruments look cool although they are usually not that useful on the ground. But do they are necessarily useless? maybe not. I discovered that the thread of the 2 connectors was actually compatible with the brass push-in connectors used in industrial automation pneumatics I had avaiable from other past projects involving pneumatic cylinders and control valves. These have the standard(in almost the entire globe, maybe with a remarkable exception) G 1/8" (BSPP) thread. Therefore I though to put the airspeed indicator to use, for example as airspeed indicator on my car: this is not something unheard outside aerospace applications, F1 racing cars do have pitot tubes too; and it's not completely useless too (can give you an hint about the slipstream of the vehicle ahead). The simplest test was performed blowing gently in the gauge inlets: the indicator movement confirmed that the instrument was working although gave no indication about the calibration. The next step was then building a pitot-static tube to be installed on my car and connected to the airspeed indicator. The Airspeed indicator works as a differential pressure sensor. It measures the difference between total pressure and static pressure. The difference between total and static pressure is called dynamic pressure and depends on air velocity(squared) and air density. With a regular differential pressure sensor giving the measures in some pressure units(pascal, bar, psi etc) you should have to do the math but the airspeed indicator already does the math and shows the speed associated with the pressure difference in knots (nautical miles per hour, not exacly a road "friendly" unit). Anyway the nautical mile is 1852 m, therefore multplying knots times 1.85 you get the speed in km/h (or multiplying by 1.15 you get about the speed in mph), that's anyway much easier to do in your mind easier than the math in the case of a regular differential manometer (calculate 2 times the difference of total pressure minus the static pressure all divided by air density and finally and then get the square root of the result, which would be probably in m/s and then you have to multiply by 3.6 to get km/h). What we need to know is that the airspeed indicator needs 2 pipes carrying an information via pressure, one is the static line the other the pitot line. The pitot is a pipe ending with a hole facing direcly in the airspeed direction (facing forward of course). The static pressure is obtained by pressure sampling holes placed on the sides of the probe. (or sometims flush-mounted holes on the fuselage). Since I want to use the pitot-static tube on my car and I don't want the airspeed probe protruding ahead like on the nose of a jet fighter (I don't want the instrument to be damaged by blood samples from cyclists and pedestrians, I'm kidding, but that would be actually dangerous also for someone just walking around the parked car) so I want to install the pitot-static probe elsewhere, probably on the hood, and then I have to bend the probe. Bend the bigger pipe as desired (actually anything from 0° to 90° can be ok if the bend is done properly) with the help of a round object. I bent the pipe about 15 cm from the end. Since my bend wasn't exaclty spectacular I decided to make the smaller pipe come outside the bigger one before the bend. Therefore I drilled a small hole (about 2 mm) about 2 cm from the bend. I made the smaller pipe pass inside the bigger one and then pass through the hole and then run along the bent section of the pipe. Since the probe has to be connected to the gauge with flexible tubes of the same size (I will because it's easier to find and to connect) I will need something to adapt the smaller pipe to the larger tube. I placed a short (3 cm) piece of 4 mm copper pipe on the end of the smaller one (overlaying for 2 centimeters) and then I squeezed the pipe using pliers and then soldered. Check the connection to be airtight(blow air in the small pipe at one end and use the finger to close the other end, if air escapes it's not airtight) but also that air can flow(the pinching and soldering did not obstructed the pipe). Use the soldering iron to make the hole(the one near the bend) in the bigger pipe airtight too. I placed a small coil of soldering wire(coiled directly on the small pipe) on the small pipe and slided along untill entering the bigger, It was intended to keep the smaller pipe centered inside the bigger one. I should have used also a small ammount of iron or copper wire (or anyway something not melting so easily) to achieve this. Then solder the tip adding a generous ammount of soldering wire. Cut the small pipe at the desired length. be careful that the cut section is perpendicular to the axis. then file and sand the soldering until the excess is removed and the transition from the small to the large diameter is nice and smooth. then file and sand the excess. bend the 2 connectors away from each other since they need enough distance to accomodate the thickness of the flexible tubes. I tested the contraption in a temporary configuration. The airspeed indicaotor is held in place by a smartphone holder with suction cup attached to the windshield. The pitot-static probe is attached to the roof railing using insulation tape. Don't hesitate to leave a comment, and if you liked this instructable and you think it deserves don't forget to vote it in the "Sensors Contest 2017"
I used to work on aircraft instruments. Because the gauge is part of a system including the pitot tube, it won't be accurate till it's calibrated. You'll have to compared indicated speed with a speedometer or GPS. Also, the pitot tube has to be in calm air, not turbulent to read right. Get one that reads no higher than 100-140 so the scale is wide enough. Be aware it won't be real accurate at very low speeds and that driving into a headwind will make it read high. As I already I'm an aerospace engineer and I'm aware of that to be a measure you can trust it would require much more attention to pitot placement and calibration, and that in general airspeed is not a good measure of ground speed in case of wind. So this is not something to be intended as a measure to rely on for example to respect speed limits. My primary goal was exacly to place this system in my car so I could drive at a known speed (for example 90 km/h according to speedometer / smartphone GPS) and read the related airspeed measure in a day with no wind at all (where I live, except for occasional storms, wind is extremely rare, especially in winter and summer). 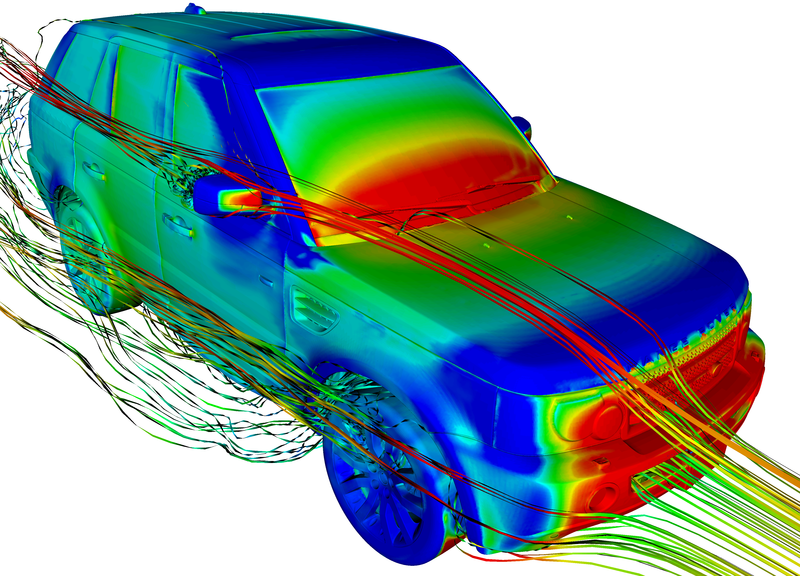 Unfortunately I have no avaiable any CFD simulation of the aerodynamic of my car model but anyway from other simulations ranging from racecars to off-road ( http://ww1.prweb.com/prfiles/2009/01/20/1126544/J... ) , including similar stationwagon designs, the flow on the hood(at least the ones with no bumps like some muscle cars) is consistently laminar. In addition as you can see the normalized pressure on the hood usually range from pressure higher(red/orange/yellow) than undisturbed flow (for example close to a steep windshield) to pressure lower(blue/cyan) than undisturbed flow (for example near the front end of flat hoods). Flow continuity implies that somewhere in between those 2 regions there must be a region with conditions equivalent to undisturbed flow and this is very convenient. Very good. I imagine if the wind velocity was constant, one could make two runs in opposite directions and average the reading. My last job was actually building and testing pitot tubes and static ports, BTW. It's an interesting project you propose. Great idea! Get a part of aircraft - one of my dreamboats!